Hello, hello! How is your week going? I have a case of the blues today, but it has absolutely nothing to do with my mood and everything to do with the crazy moon and our son's closet plans! Since it has been awhile, I am going to back up and catch you all up with a little backstory. Our younger two boys shared a room for quite a few years and became the best of friends during that time. You can see their room here. When our youngest son took over our guest room a little over a year ago, we removed his bed and clothes and the rest of the room remained unchanged. We put some focus on making updates to the guest room so our youngest would feel more at home there and could begin to make it his own. We still have a few things to finish up there, but we have also promised our now second teenage boy (13!) that we would help transition his space into something a bit more sophisticated to compliment the wonderful young man he is growing to be. The entire room needs love and the closet is just the beginning. In fact, it was a "quick" closet update that I originally wanted to do, that is suddenly springing on a couple of additional room upgrades as well. 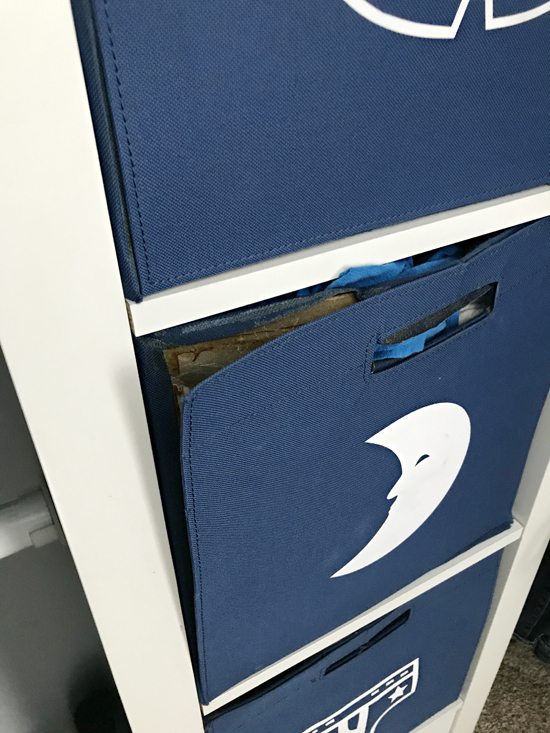 We get asked for updates on our previous systems and closets quite frequently, and I am happy to report that the IKEA hack closet solution we created for our two growing boys was amazing. It held up really well and did the job for many years. In fact, we all voted for more real-life shots, so this is my son's closet straight from my cell phone a few weeks ago (below). From a distance, not too bad. He is completely in charge of maintaining it himself, and although he fights hanging some of his laundry, he has done a pretty good job overall. A closer look, however, will show that the bins are falling apart after 5+ years of use because he has literally outgrown them. He is my "stuffer" and prefers to put his clothes into the bins vs. hanging them. And as he has grown, so has the size of the clothes he wears. And that means less room inside of the bins for said clothes. He is also a boy who needs a quiet and organized workspace of his own, completely free of outside distractions. He and I are very similar in that respect, and we both just work better when we can isolate ourselves and put on headphones and give our current work our full attention. He currently has a small desk in his room (placed where his brother's bed was previously located), but with that piece of furniture, there aren't many layout options that would also accommodate a dresser. 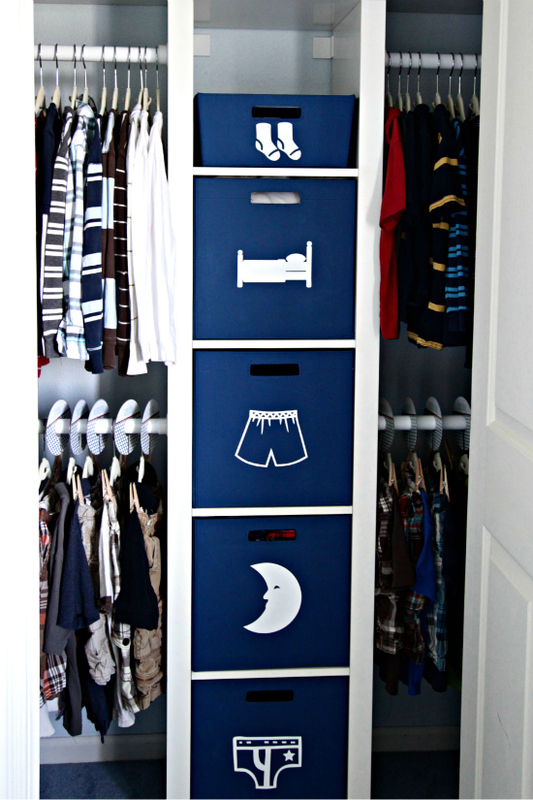 And a dresser (or more room for folded clothes) is one of his top requests for the room. 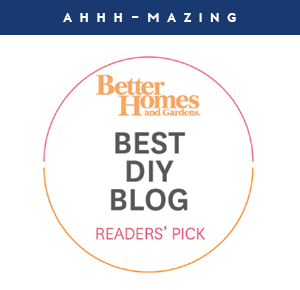 I am a believer in listening to my kids and trying to entertain what they want in their rooms, and I really encourage them to help me problem solve and design their personal slices of our home. I also try to design their rooms in ways that are easiest for them to maintain based on their personalities. Our oldest wanted to put his desk in his closet, and to this day, it is still his absolute favorite spot in his room. Our youngest had two closet cavities to work with; one is for a desk and the other is for his clothing. Again, worked out great for him and he is also a very happy camper. Our middle man wanted a dresser and a desk, but we agreed he would still need to hang some of his clothing. He wanted to keep his desk in the main area of his room, so I began troubleshooting how to get a dresser into his small closet. With the wing walls on both sides of the closet taking up so much usable space, it made it nearly impossible to add decent sized drawers. My gut told me for months to just widen the opening to make the closet as a whole much more functional. 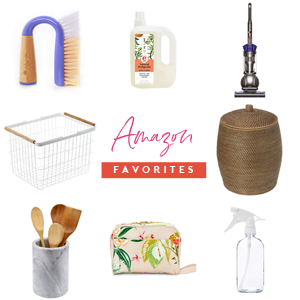 So I shopped closet solutions and weighed out quite a few options. 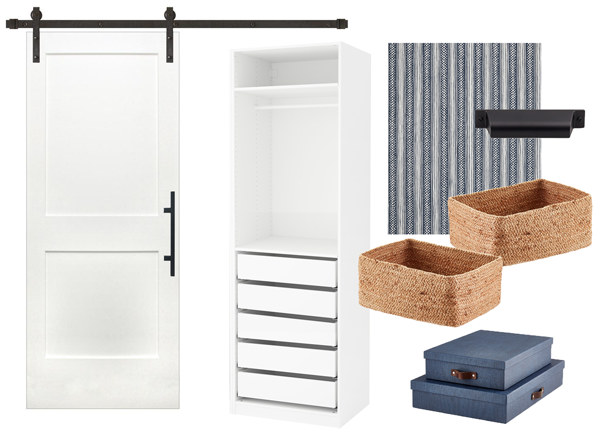 After a few custom build ideas weren't panning out, I checked out Elfa, ClosetMaid, and IKEA. With both our son's needs and our budget in mind, we landed on the IKEA Pax System. We have personalized components from this system quite a few times for different types of storage projects, and have always been happy with the quality and options available. 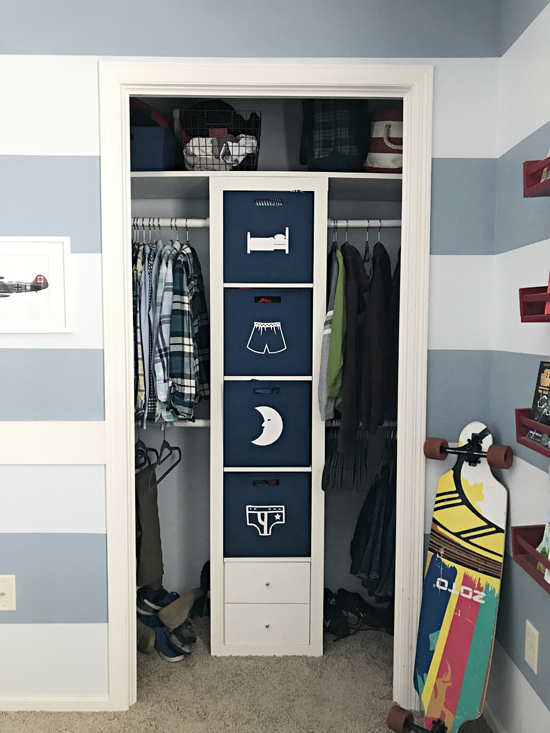 With the solution we designed for our boy (mocked up above), we would be able to add a pull-out shelf for shoes, five drawers, three shelves and still keep double hanging storage. In terms of this project, we had two primary goals; upgraded storage and an updated look. I will miss those labeled canvas bins, but they most definitely seem more appropriate for younger lads and have seen better days. And here is where that lovely snowball effect comes into play. We have begun with the project and widened the door opening. But that led to removing all of the trim. And because we are in the process of upgrading all of the trim in the upper level from the previously painted oak, now is the time to do that in this room. Then I was asked to paint over the stripes. Although I completely agree, I may have crumbled a bit just thinking about it. I have a ridiculous love for this room because of the memories made creating it with the boys, the idea of just painting over it all has been a hard pill to swallow. But the time has come for new memories and plans and giving our boy a space that is just for him. And every time I do a closet, I paint it, or find a way to make it special and tie it into the room. It is just how I roll, so now we are going to paint the walls too. And maybe the ceiling. Finally, no matter how great the closet system, I still want the option to conceal it. Because the boys are in charge of their own rooms and closets, sometimes it is just nice to pull a door shut. To accommodate the new wider opening, we are going to build and install a sliding door. And patch the carpet. And the walls. And swap out all of the almond colored outlets, switches and plates. Whew! Leave it to me to make a mountain out of a molehill. Just widening the opening to the closet instantly made the room feel twice as big. So I am really excited to see how all of this comes together. And being that our son has been temporarily relocated to another room while we take over his space, we are going to kick things into high gear. 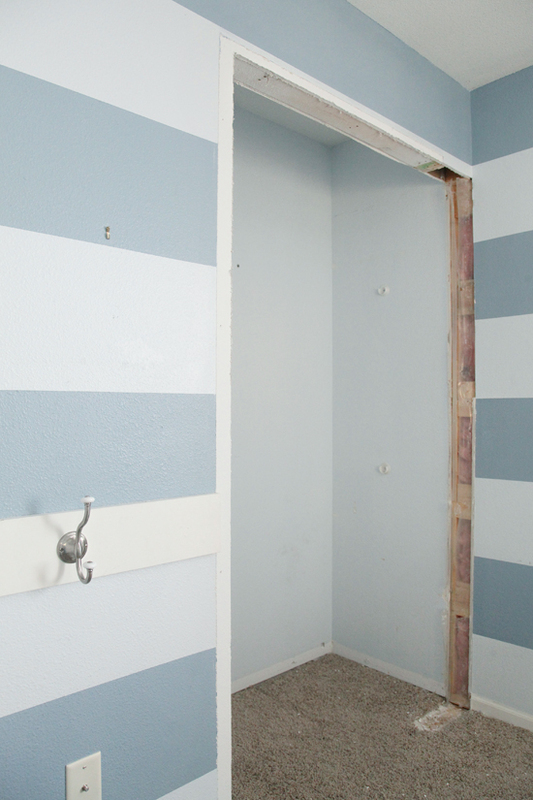 The closet components and paint have been purchased, the wall is being patched and plastic is being laid out. In some ways, I can't wait to tear into all of those IKEA boxes, but at the same time... wine and hugs will be welcomed. The entire room and our ideas may be a little confusing right now, but I plan to take more photos and continue to tell the story as the entire space evolves. It should be a fun week because paint alone is a very powerful thing! A fabulous closet plan! I love how you mapped out precisely what needs to go where. Woo hoo! Can't wait to see both the progress photos and the reveal and how you work your magic! I love the "real" shots! This looks like work, but fun. I love the idea of widening the opening and adding a sliding door. That idea may come in handy later on in my own house. I love your ideas. It's going to look great. But I know what you mean about tissues! My son starts kindergarten next week and although I love the stage they are at, I'm so sad about that preschooler/toddler stage being over. Big hugs. That is such an exciting milestone, but does pull at the heartstrings a bit!! Sending hugs for next week! Can't wait to see how it all turns out! You are making me rethink all of our closets now, such a great idea to add in drawers and shelves while still keeping some hanging space! Also sending hugs as you tearfully throw away those cute bins....I remember watching along with their shared room progress many years ago! Can you believe that was back in 2011?! Thanks for following along so long! I can’t believe how time has flown by! First of all I love the mood board. I'm sad about the stripes... I love them. The closet design is really nice. I really missed reading your blog. I know you needed the time off but I love the inspiration. 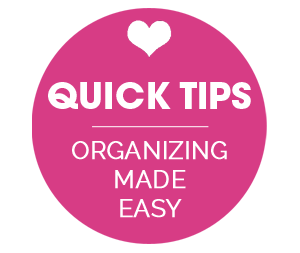 You probably already know this since you are the queen of painting, but just in case - you may want to smooth out the lines in between the stripes before you paint the room. I work at a school and they recently painted a solid color over what used to be a striped wall. You can still see the lines between the stripes because there is a slight ridge from the different paint applications. Can’t wait to see how the room turns out! OMG this is going to be so beautiful but also makes me a little sad as I think that my little 2 year old boy is going to become a teenager someday! This is going to be terrific! Good for you that you're keeping up with your boys' closets. I gave up on my teen boys' (15 & 18) closet several years ago and it's at the point that I won't even bother until the 18 year old leaves for college this fall...it's just too far gone and its just a nightmare in there. What size hanging/sliding door will you use? Hi Meghan! We are going to build a 4 ft sliding door to cover the opening completely. Your plans sounds great and i love that it will work for your son and his needs. IKEA wardrobes are fab as you can design them for your needs and are a good price too. After completing a home renovation and addig a walk in robe we used IKEA to make it our own and love it! The compliments we get make me feel it was the right choice and didn't break the bank! I agree! They can be customized in a lot of amazing ways to create a high end look on a budget. We hope to revamp our own closet the same way some day. Glad to hear you love the outcome of yours! Love your ideas for the closet.. Wish we had something like that in India.. Here we mostly have stand alone armoire. A dresser is very useful for clothes, we have a dresser and a wardrobe for our 4 year old. I hang most of our clothes but she helps with keeping the folded clothes in her dresser. Can't wait to see the finished room.. So excited to see it all come together! I love your plans and I bet your son is going to be so happy with the changes! I remember when you did that room ❤ but im so excited to see the changes! I love your projects, and the timing is so perfect. I just started planning my sons closet. ❤ happy painting! Oh my goodness, yes! He can't stop talking about it. I love it! Love the plans you have and can't wait to see as things progress! Seeing how you plan a closet out helps me a lot. I'm in the process of trying to figure out my boys' closets too. Thanks so much! Looks like a fun project. 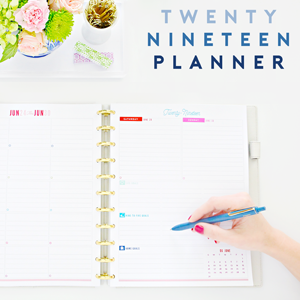 I love how you layout your plans. 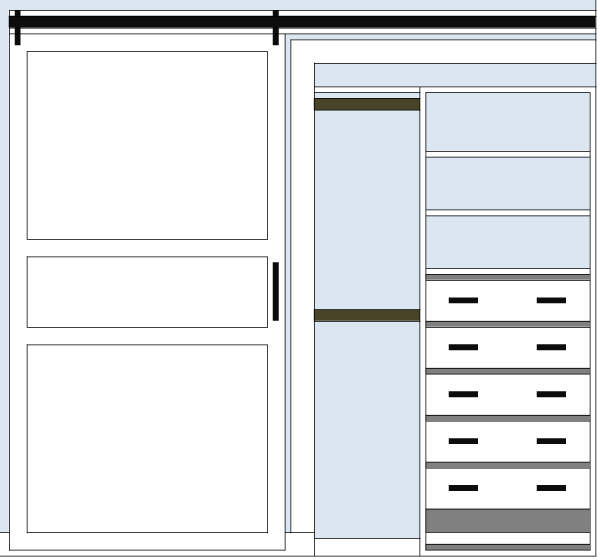 Quick question, what software did you use to animate your blueprint of the closet with the labels for where everything will go? Thanks! 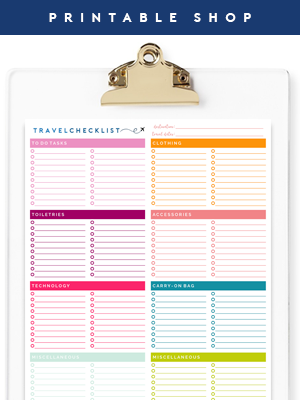 Love the in-progress post and love the plan and can't wait to see how it turns out! You're an inspiration to me because the snowball-effect is how most of my house projects go...but then I get overwhelmed by it and don't start most of them. Thank you for inspiring me to just START. Don't you just love it when projects spiral like that?! haha, I recently went to IKEA as well for storage and LOVED the ALGOT system. Now EVERYTHING has a place...I think reading your blog is starting to rub off on me :) Thanks for the inspiration! So excited to see how this turns out! wow, that turned into quite the project! Can't wait to see how it turns out. Love the mood board, very grown up! Looking forward to all the details on the various projects involved in the make-over. Wow, this is a big project, but it is going to be amazing! Can’t wait to see the results!